The Office | The Ack Attack! 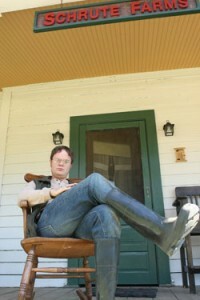 TripAdvisor.com is featuring a page for Schrute Farms where you can read other people’s ridiculous reviews, which range from amusing to disturbing. You can add your own review as well! Entertainment Weekly’s Lost at Comic-Con Coverage! Jorge Garcia, Michael Emerson, and Nestor Carbonell talk to Michael Ausiello about the Comic-Con panel and the last season of our beloved Lost. And now I need to see Alpert in a Conquistador costume. Guys, I have never wanted to be at Comic-Con more in my whole life. I have many theories as to where this final season is headed, but I’ll be posting about that more once we get a little closer to the premiere! Also: a big collection of panel videos all in one post! Was that Richard applying eyeliner that I saw!? Michael Emerson’s audition as Hurley SLAYS ME hahahaha! And the death reel is awesome haha. Daily Dose of Lost Suggestion Box! If you have a quote you’d like me to use in a future Daily Dose, please leave it here with the character names and the name of the movie/TV show/book/what have you. If you leave a name and don’t comment anonymously I will be thanking you in that day’s post. Comments will be deleted once I’ve used the quotes so it’s less confusing for me! And now the triumphant return of the Daily Dose of Lost! Basically every day I’ll be posting a quote from a movie/TV show/what have you that is cleverly paired with a screenshot of Lost. It’s to help us get through the Smoke Monster-sized hiatus and hopefully give you a giggle. Shortly I’ll be posting a “Daily Dose Suggestion Box” where you can leave some quotes you’d like me to use! Here is a blurb from E!’s Watch with Kristin concerning a major…happening later this season. On a scale from 1-10, it’s about a 5 spoiler-wise. Consider yourselves warned. A simple list of my absolute favorite Jim and Pam moments from over the years!! You are currently browsing the The Office category at The Ack Attack!.